New York Tails searched far and wide for some of the most unique and unusual gifts for your special pet (or pets!) this season. Dogs, cats, birds...nobody had been left out! These are great gift ideas for your pet or-better yet-the pet lover on your list that is impossible to buy for! As always, your neighborhood pet shops and the fine people who work in them ready and willing to help you, so if you see a present here that you like, ask them for it! For a list of pet shops in your neighborhood, click here. Christmas ID tag lights dress up and identify your adventurous pets with bright red colors this season. Kitten Mittens is kitten nirvana--pompoms, catnip, jingle and interaction. Fit this glove on your hand and play. Finger tips are reinforced for protection from feisty feline claws. Available in three velour patterns for the most fashionable feline: Leopard, Zebra and Tiger. Happy Dog Toys also makes the Original JingleBone which your pup can play with. It has jingly tennis bells inside. Oravet gives cat and dog owners a holiday and year 'round break. A weekly application across your pet's gumline will prevent plaque and tarter. Talk with your vet about a prescription on your next visit. Sherpa does it again with its new "Houndstooth Paris Pet Carrier" line of pet carriers. In Pink and black or red and black. Visit www.sherpapet.com for a preview of what you'll find in your local pet shop this season! 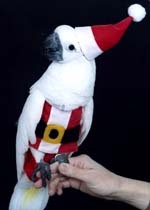 Dress up your bird for parties, bring him out for errands or just to visit your friends. Everyone will be impressed with Flightsuit fashions, but only you need to know that these outfits also keep his droppings contained. The Flightsuit is a bird leash, harness and diaper combined. Available for all sizes and types of birds. Zoo Meds makes starter kits for all the reptiles--turtles, bearded lizards, geckos, they came with home, dishes, foods, cleaners, instructional books....everything but the pet. Photo courtesy of Zoo Med. Bunny Bytes has soft and hard presents for rabbits. Their seasonal mini snowflake print bunny blankie is anti-pill fleece and cozy. And they have all kinds of feeding plates for meal time. If your pet store doesn't carry them, these books and CDs may be found in your local book or record store. As always-don't be afraid to ask! Murry Weinstock's "Tails of the City" are songs that are "written from a dog's point of view." With titles like "Big Dogs Need More Food", ''Chase That Ball" and "Popcorn Paws", this CD is an eclectic mix of jazz, funk, and rock. It will get your tail wagging and your toe tapping. Produced by Lovenotes Records. 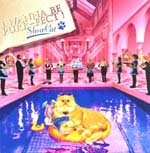 Show Dogs and Show Cats, by Diane Corrado of Chanteuse Music are 1940s-50-ish show tunes that are an ode to the particular type of person who shares their lives with show dogs or cats. They're specially packaged as a musical mailer/greeting card just in time for the holidays. 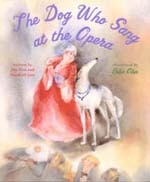 The Dog Who Sang at the Opera, by Jim West and Marshall Izen, is based on a true tail about a dog who gets a little too much into the act at the Metropolitan Opera House. Gorgeous illustrations by Erika Oller make it complete. A great gift for the kid in your life or the kid in you. By Abrams Publishing. Albert, The Dog Who Liked To Ride In Taxis, is a sweet tale about a too-adventurous dachshund who gets more than he bargained for when he jumps into a New York City taxi. By Cynthia Zarin, with whimsical illustrations by Pierre Pratt. By Antheneum Books. 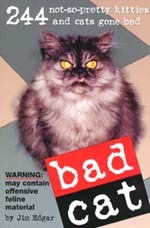 Bad Cat, by Jim Edgar, claims it contains "244 not-so-pretty kitties and cats gone bad." And it delivers. The book contains hundreds of photographs of cats caught in compromising positions-- and boy, can it get ugly (in a cute way, of course.) Any die-hard cat lover will appreciate the colorful antics of these kitties. Published by Workman Publishing. Mystery lovers looking for a new novel to curl up to on a cold winter's night might want to check out the latest offering by Cynthia Baxter, Putting On the Dog. The book, the latest in the author's "Reigning Cats & Dogs" series, continues the adventures of fictional Long Island veterinarian, Dr. Jessica Popper. This one finds the vigilant vet on the hunt for the person who killed a celebrity photographer with an ice sculpture at a fancy fundraiser. By Bantam Books. Donate on a loved-one's behalf to some of the amazing animal groups here in New York that are working toward making life for the city's most at-risk animals a better one. Consider a gift to the Mayor's Alliance For New York City's Animals (www.animalalliancenyc.org), the ASPCA (www.aspca.org) the Humane Society of New York (www.humanesocietyny.org) and many others. United Action for Animals has opened a thrift shop on 402B East 80th Street (off of 1st Avenue), opened weekdays from 10 am to 5 pm. High-quality vintage curios and collectibles lines the aisles. All proceeds from the store go to support UAA's various programs, such as Grateful Paws (low-cost veterinary care for needy New Yorkers) spay/neuter clinics, and other worthy causes. From Nov. 21 to December 24, local Petcos will once again run a "Tree of Hope" fundraising program. Customers can donate $1, $5, $10, $20 toward animal welfare groups here in New York. A $20 donation gets you a keepsake snowglobe. Ollie's Place, on 203 East 26th Street (off of Third Avenue) is wholly-owned and operated by Mighty Mutts, a local rescue group here in New York. All profits go toward adopting out their animals, and cat adoption is right on the premises! The Animal Network of New York (ANNY) is a group of locally-based pet businesses who will give a percentage off of their goods and services to dogs that were rescued or adopted from New York City rescue groups and shelters. From dog walking to in-home dog washing, transport, photography and more! For a list of participants visit http://www.animalalliancenyc.org/services/care.htm.